Flyp stands with LUNG FORCE on Advocacy Day - heres how you can too! LUNG FORCE is an organization near and dear to our hearts here at Convexity Scientific, the makers of Flyp Nebulizer. LUNG FORCE unites women and their loved ones across the country to stand together against lung cancer and for lung health. We participate annually in several events and campaigns to support LUNG FORCE. Today, they need your help! So, we're sharing the information below on behalf of LUNG FORCE in support of this important advocacy day. 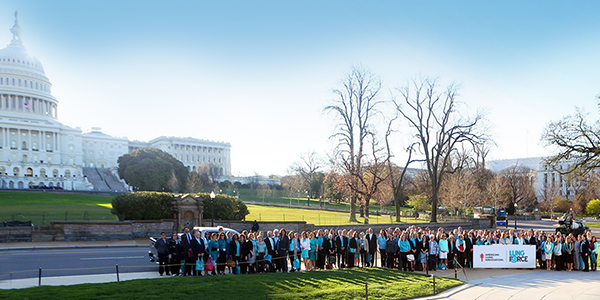 Today, LUNG FORCE Heroes from all 50 states are taking our shared cause to Capitol Hill in Washington, D.C. They're asking Congress to support $41.6 billion in medical research funding for the National Institutes of Health (NIH) in fiscal year 2020, and they’re urging Congress to protect patients with pre-existing conditions, including lung cancer. On Wednesday, April 10, call your senators and representative and ask them to protect patients with pre-existing conditions, including lung cancer. Use our Lung Action tool to find the phone numbers for your two senators and one representative. Need pointers for speaking with your members of Congress? Please refer to this easy-to-use call script available on our website. Please act now—your calls have the most impact. Tell your senators and representative in Washington, D.C. that we need them to support research funding for the National Institutes of Health and why we must protect patients with pre-existing conditions. We've drafted an email to Congress, all you need to do is fill out your info, personalize (if you want) and send. Connect with your senators and representative using the suggested Tweet below. Make sure to personalize with their Twitter handles. (You can find their Twitter handles using theLung Action tool—click the ‘+’ to display this information).